This is a pattern for a diaper cover, hat, scarf and booties that I made for a co-worker. The set can be made in any color combination. My co-worker requested navy blue and green. Rd 1: Attach green at any point along size between Rw 10 and Rw 14, ch 1, sc evenly along edge of DIAPER COVER with 3 sc in each corner of DIAPER COVER. Finish off and weave in ends. Fold DIAPER COVER into desired position. Working through Rw 18 of the front and Rw 2 of both side straps without catching any of the dc of the side straps, sew button to DIAPER COVER. Rws 2-4: Ch 2, turn; dc in each dc across. (9) Change to green. Rws 5-8: Ch 2, turn; dc in each dc across. (9) Change to navy blue. Rws 9-12: Ch 2, turn; dc in each dc across. (9) Change to green. Rws 13-16: Ch 2, turn; dc in each dc across. (9) Change to navy blue. Rws 17-20: Ch 2, turn; dc in each dc across. (9) Change to green. Rws 21-24: Ch 2, turn; dc in each dc across. (9) Change to navy blue. Rws 25-28: Ch 2, turn; dc in each dc across. (9) Change to green. Rws 29-32: Ch 2, turn; dc in each dc across. (9) Change to navy blue. Rws 33-36: Ch 2, turn; dc in each dc across. (9) Change to green. Rws 37-40: Ch 2, turn; dc in each dc across. (9) Change to navy blue. Rws 41-44: Ch 2, turn; dc in each dc across. (9) Change to green. Rws 45-48: Ch 2, turn; dc in each dc across. (9) Change to navy blue. Cut 40 4 inch pieces of green yarn. Fringe 4 pieces of green yarn in five places on each end of scarf. 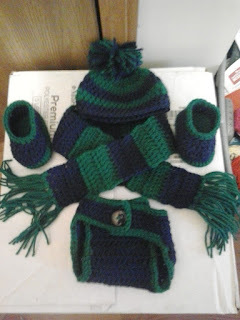 Using navy blue and green yarn, create a pom-pom for the top of the hat. 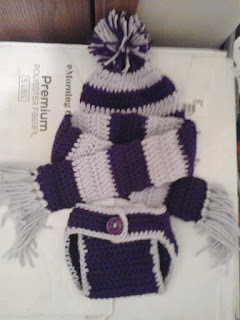 This crochet pattern is an original pattern and is © by Christjan Bee (January 2018). Please do not claim this pattern as your own. If you wish to share this pattern, you may link to this pattern but please do not reprint/repost it on your site. You may print and keep a copy for your own personal use but you may not sell or distribute it, or sell items made from this pattern.